In Sukachi, Ukraine, a small food and liquor store in a converted trailer doubles as the village bar. Nina Dubrovskaya was a librarian, but she only earned $100 per month. It wasn't enough. Now she works up to twelve hours per day here and earns about $200 per month. 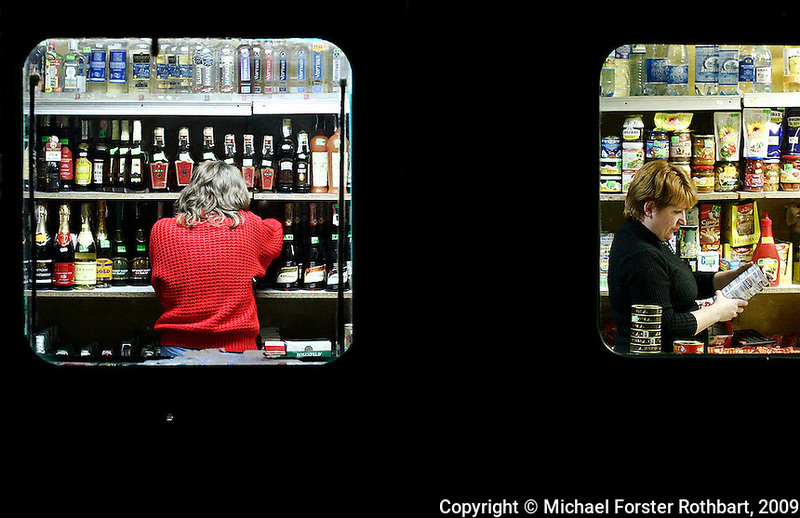 Original caption: .In Sukachi, Ukraine, a small food and liquor store in a converted trailer doubles as the village bar. The store's two employees restock shelves and drink tea in the evening. They work up to twelve hours per day and earn about US$200 per month. Sukachi, a village of about 2,000, is south of the Chernobyl Exclusion Zone..-------------------.